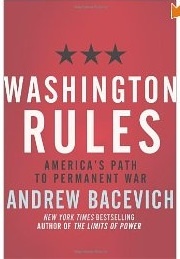 Andrew J. Bacevich’s latest book, Washington Rules: America’s Path to Permanent War, arrives in stores this week. In what should serve as an introduction to his book, Bacevich‘s recent essay on TomDispatch.com is entitled: “The End of (Military) History? : The United States, Israel and the Failure of the Western Way of War”. A career army officer who is now a professor of international relations at Boston University, Bacevich has, since 2005, produced four books that cover both US foreign policy and the role the military plays in that policy. His earlier books are The Limits of Power (2008)The Long War (2007) andThe New American Militarism (2005). Bacevich is a 1969 West Point graduate. He served in the United States Army during the Vietnam War, in 1970 to 1971. He held posts in Germany, including the 11th Armored Cavalry Regiment, the United States, and the Persian Gulf before he retired with the rank of Colonel in the early 1990s. He holds a doctorate in American Diplomatic History from Princeton University, and taught at West Point and Johns Hopkins University prior to joining the faculty at Boston University in 1998. On May 13, 2007, Bacevich’s son, Andrew J. Bacevich, Jr., was killed in action in Iraq by an improvised explosive device south of Samarra in Salah ad Din Governate. Bacevich’s essay, and his new book, are warnings to Americans, and to Israelis, that we are racing down our mutual “path to permanent war”. This summer, Israel is acting very much like a preprogrammed Manchurian Candidate, in its determination to stay on the path toward war with Iran. In John Frankenheimer’s 1962 film, a former Korean War POW is brainwashed by Communists into becoming a political assassin. Only this time it is not just one soldier who has been brainwashed, but the nation of Israel which is being pushed by a radical Zionist government toward an attack on the ancient land, people and culture of Persia. Wars can no longer be won. European nations know this, which accounts, in part, for their reluctant and minimum involvement in both Iraq and Afghanistan. Only two democracies failed to grasp the reality that war is never a solution–the US and Israel, both of which continue down their mutual path “to permanent war”. The US and Israel pretend to pursue lofty and peaceful goals, but in the lexicon of American and Israeli politics, peace is a codeword for forcing an enemy to accept a condition of “permanent inferiority”. The Jewish settler movement, with government support, created “facts on the ground” with waves of Jewish settlements under the pretense that permanent settlements would enhance Israel’s security. Instead, as Bacevich points out, the settlers “succeeded chiefly in shackling Israel to a rapidly growing and resentful Palestinian population that it could neither pacify nor assimilate. The “shock and awe” invasion by US troops in Iraq and Afghanistan, followed by what is obviously a permanent occupation of both countries are part of that permanent war, guaranteeing hostility and resistance to the presence of foreign troops. Our presence in Iraq and Afghanistan, Bacevich writes in a Washington Post column, has proven to be enormously destructive to our all-volunteer army. To be an American soldier today is to serve a people who find nothing amiss in the prospect of armed conflict without end. Once begun, wars continue, persisting regardless of whether they receive public support. In fact, when it comes to war, the American people avert their eyes from difficult truths. Largely unaffected by events in Afghanistan and Iraq and preoccupied with problems much closer to home, they have demonstrated a fine ability to tune out war. Soldiers (and their families) are left holding the bag. If any overarching conclusion emerges from the Afghan and Iraq Wars (and from their Israeli equivalents), it is this: victory is a chimera. Counting on today’s enemy to yield in the face of superior force makes about as much sense as buying lottery tickets to pay the mortgage: you better be really lucky. By 2007, the American officer corps itself gave up on victory, although without giving up on war. First in Iraq, then in Afghanistan, priorities shifted. High-ranking generals shelved their expectations of winning–at least as a Rabin or Schwarzkopf would have understood that term. They sought instead not to lose. In Washington, as in US military command posts, the avoidance of outright defeat emerged as the new gold standard of success. As a consequence, US troops today sally forth from their base camps not to defeat the enemy, but to “protect the people”, consistent with the latest doctrinal fashion. Meanwhile, tea-sipping US commanders cut deals with warlords and tribal chieftains in hopes of persuading guerrillas to lay down their arms. . . For the conflicts in which the United States finds itself enmeshed, “military solutions” do not exist. As [General David] Petraeus himself has emphasized, we cannot “kill our way out of” the fix we’re in. In this way, he also pronounced a eulogy on the Western conception of warfare of the last two centuries. What, exactly is the “credo” by which American foreign policy is driven? In the simplest terms, the American credo summons the United States–and the United States alone–to lead, save, liberate and ultimately transform the world. Luce’s concept of an American Century, “an age of unquestioned American global primacy, resonated, especially in Washington. It quickly found a permanent place in the lexicon of national politics. Even today, whenever public figures allude to America’s responsibility to lead, they signal their fidelity to this creed. Along with respectful allusions to God and “the troops,” adherence to Luce’s credo has become a de facto prerequisite for high office. Question its claims and your prospects of being heard in the hubbub of national politics become nil. Above all, the exercise of global leadership as prescribed by the credo, obliges the United States to maintain military capabilities staggeringly in excess of those required for self-defense. After World War II, “an affinity for military might, emerged as central to the American identity”. Whichever political party holds power in Washington, the credo and the trinity will always provide the basis for an enduring consensus that guarantees a consistency to US policy. Those institutions always include the branches of the federal government, the principal components of the “national security state”, the departments of Defense, State, and more recently, Homeland Security, along with the agencies that comprise the intelligence and federal law enforcement communities. When Senator Joe Lieberman demanded the chairmanship of Homeland Security Senate Committee; when the Israel Lobby went nuts over the thought of Charles Freeman as chair of the National Intelligence Council; and when Dennis C. Blair, who initially appointed Freeman, lasted only a year as Director of National Intelligence, the keepers of the “Washington Rules” knew what was going on. The consensus had to be protected. The “credo” had to be secure and the US-Israel team had to be free to carry out the dictates of the “sacred trinity”, global military presence; global power projection and global interventionism. That is why Bacevich calls them sacred; they must be honored. Did President Obama, who promised us change, know what was going on? He does now. You want to enter and remain in the world that runs this nation? Know the “rules” and keep them inviolate. It is a heavy order Bacevich has served up for us. As I read and reread his five points, I find myself no longer depressed over the state of our nation but immensely encouraged to keep moving forward. There is too much at stake to give up now. It is time to change the system from within. Is President Obama the Change Agent we had hoped he would be? Still too soon to tell. There are occasional signs the President knows he is trapped inside the binding chains of the Washington Rules. He needs our help if he is to break the chains which are leading us further along the “path to permanent war”. 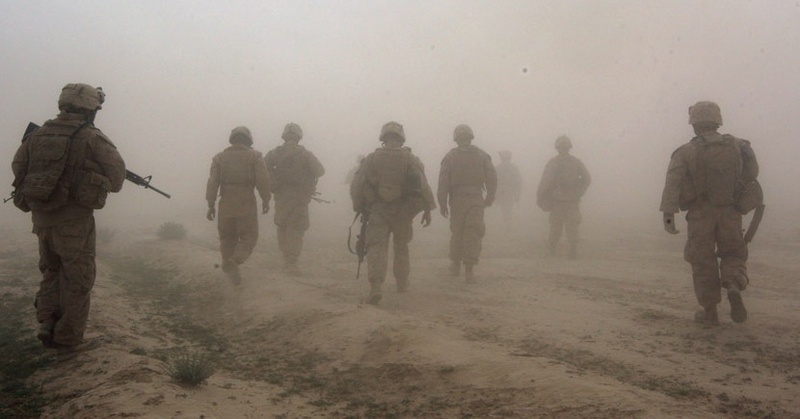 The picture above: A US Marine patrol moves through a sand storm in March, 2009, in Qalanderabed in souhwest Afghanistan. ( by John Moore/Getty Images). Image from Boston.com. Thanks for the heads-up on Bacevich’s latest — and the article. Who in Washington is reading him? With so many in cahoots with the military credo (big banks, media, and military producers/contractors), is there realistically any hope of uprooting the entrenched industry? Remember the “peace dividend”? This is a surpassingly excellent “Wallwriting”; quotable quotes and profound thoughts in abundance. Still, I find myself unable to muster any optimism along the lines of the conclusionary paragraphs. Our “entangled” nation is prostrate in subservience to the overwhelming dominance of Israel and the psychotic Zionists who rule it with sneering disregard for any way but their way. President Obama has been taught the lesson that he operates within severely constricted boundaries. Pity the hapless Palestinians, at ground zero, with no justice, no peace, no future…. Obama has missed many opportunities–the most recent was to fail to use the fiasco in the Gulf of Mexico as the springboard for a new energy policy. Another, to kneel before the unholy coalition of Bibi Netanyahu and the settler movement. It may be too soon to make a judgment on Obama’s leadership, but he is fast losing his support base through inaction and misjudgment. I do not think any president can decontaminate DC from the warmongering greatest crime syndicate in the history of mankind which dictates the agenda without any risk including physical survival. JFK was perceived as a potential threat to this syndicate’s designs and was eliminated, but no-one dares to openly identify these evil people who did it! Over the past 40 years America has become enamored with the word “War”. It probably relates back to the romanticism that immediately followed WWII. There is a paradox, however, since the popular use of the word implies a struggle to victory where victory is virtually impossible. Whether it’s war on terror, poverty, drugs, pollution, crime, or dog poop on the sidewalk the term only attempts to marshal conventional, conservative support for policies that engage activities which have always existed…and always will. In that sense Bacevich is right, “war” as it is perceived today is permanent, and, more often than not, political. If we want a practical answer to foreign military adventures instead of only sticking it to a few (I know, I had a son in Iraq for 2 years), I suggest we pay for these engagements on a current basis instead of borrowing the money from future generations. Annually assess a progressive excise tax on the American people that covers 100% of the annual budget for these foreign “wars”. Then see if you can find a Congressman or Senator who will vote to keep them going.